Livingstone College has one of the top guards in the CIAA and quite possibly its highest flyer. But Roger Ray and Co. want banners. North Carolina is, first and foremost, a basketball state. To be more exact, a college basketball state. Of course, everybody knows the big names– UNC, Duke, NC State, Wake Forest (which is in Winston-Salem, not Wake Forest, btw). Then there are the other schools like East Carolina, App State, High Point, Davidson, UNC-Charlotte, Campbell…you get the picture. That’s not to mention the D1 HBCUs in A&T and NC Central, both of whom have rich basketball traditions that go back decades. And in the CIAA there’s Winston-Salem State, its D2 national title and Basketball Hall of Famers. Simply put, it’s easy for people to forget about Livingstone College. It’s a small HBCU located halfway between Charlotte and Winston-Salem in quaint Salisbury, NC (pronounced SAULS-BERRY, for you out of town folk). Established by the African Methodist Episcopal Zion Church back in 1879, its claim to fame in HBCU circles has traditionally been that it hosted the first-ever black college football game againt Biddle College back in 1892. Located in the heart of campus is New Trent Gymnasium. It doesn’t stand out too much from the rest of the venurable buildings on the 272 acre campus on the outside. But once you get inside the tight confines on winter evenings, it is a basketball madhouse. When CIAA South division rivals like Johnson C. Smith and WSSU come to town and the Blue Bears are running and gunning, it is an atmosphere that rivals any in the state. Including that gym in Durham. (And no, I don’t mean McDougald-McLendon Arena). This is the place that the CIAA Southern Division leaders, led by two of the conference’s most exciting players, call home. Roger Ray and Lydell Elmore are like the Gary Payton and Shawn Kemp of the CIAA when LC gets to fast-breaking, as defenses have to choose between trying to bottle up Ray or keep the Elmore Twins (his brother Nevar can get up and go as well) from catching alleys and bodies and ending up on IG. Listed at 5’9 (and that’s generous), Ray is the shortest person on the court most of the time, but he’s usually the center of the other teams attention. And for good reason. The junior from Raleigh specializes in putting the ball in the bucket, averaging 20.7 points per game through early February. He once put up 51 points against Allen University while at Concord (WV) Prep. By his own admission, Ray wasn’t exactly a prized recruit when he got to Salisbury. But head coach James Stinson knows talent. He turned Livingstone from an afterthought in the CIAA into a two-time champion and perennial contender in the conference by finding diamonds in the rough and importing them to Salisbury. Names like Mark Thomas, Jody Hill, Eric Mayo and Ty Newman loom large in recent CIAA history, and Stinson knew that he had the talent. Ray became a contributor as a freshman, hitting game-winners and making the conference’s All-Rookie squad during the 2016-17 season. Now in his third year, he’s already the school’s all-time assist leader. He’s also stepped up as a leader on the court, particularly when it comes to assisting the Elmore Twins, along with the rest of his teammates. The Blue Bears are definitely a tight-knit group. Instead of going their separate ways for the summer, the majority of the team hunkered down in Salisbury, going to class and working to get better for the fall and winter. Lydell Elmore doesn’t do a lot of talking. He mostly lets his game speak for itself. But ask him about Ray, and he opens up, if only just a bit. Elmore and his brother, Nevar, stand out at Livingstone and in the CIAA. They are 6’9, which might as well be 7’3 in Divsion II basketball. Hailing from tiny Branchville, South Carolina (Orangeburg-area) this pair turned heads around the conference last year when they basically appeared from nowhere and started dunking on smaller defenders with ease. Lydell is the bigger offensive weapon of the two right now. He’s averaging just over 11 points, good for second on the team. Nevar is considered the defensive ace, while his offensive game is still developing. Lydell says it was his brother that was responsible for him landing in Salisbury. It didn’t take long for Ray to realize what he had in the Twin Towers, as they were called back home. Stinson has noticed, and he’s pleased. A New Banner in New Trent? There are a number of banners sprinkled above the rims that Lydell and Nevar Elmore get above on Gamedays. Two of them represent CIAA Tournament Championships in 2014 and 2015, the only two in Livingstone’s history. When Stinson arrived in Salisbury from Barber-Scotia College in 2004, the program had never even been to the CIAA title game. 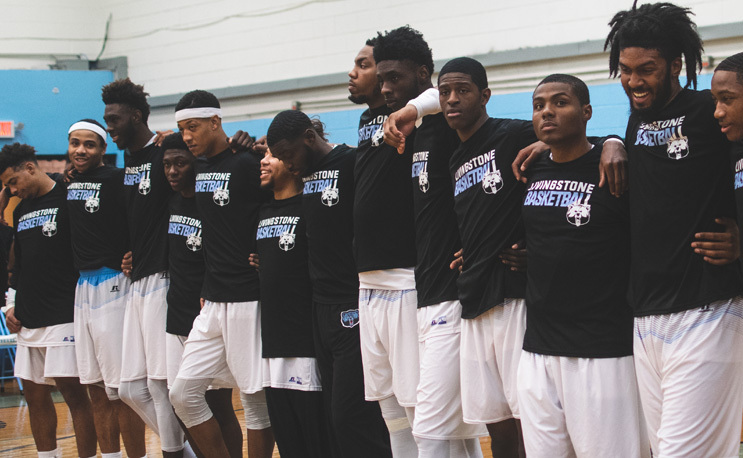 Livingstone made it to the CIAA title game every year from 2013 through 2016, claiming the two titles in between and making three NCAA Tournament appearances. The past two years have seen LC fold on in the conference’s final four. Ray wants to get back to the winning ways. “We’re just trying to learn and be around the championship culture that was already here, and we’re trying to re-establish it. The last two years it hasn’t been in that direction so we just try to learn from them and not be complacent,” he said. Looking Ray in the eyes, you can tell that he means what he says. The next week brought ups-and-downs, a second-half blowout loss to Shaw in his hometown followed by an emotional road win over WSSU in which Ray scored 33 and knocked in the game-clinching free throws. The Blue Bears sucked the life out of the other team’s gym and headed off to the locker room with little emotion. Less than three weeks from the day that the new CIAA champ will be crowned, LC is 15-7 after knocking off Shaw, the only Southern Division team to get the best of it this year. It has the second best record in the CIAA after Virginia State. That’s nice, but Ray has his eyes on the prize, and he’s making sure his teamates do as well.